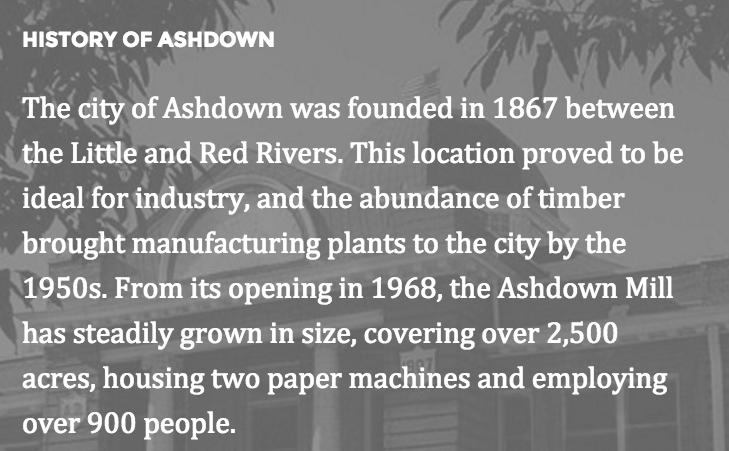 Nearly 50 years since it was founded, Domtar's Ashdown mill is now one the largest paper producing facilities in the world. Domtar's Ashdown Mill is located in Ashdown, Arkansas and is one of Domtar's 13 pulp and paper mills in North America. The mill has three pulp lines and two paper machines, with an annual paper production capacity of 378,000 tons and an annual pulp production capacity of 707,000 tons. The Ashdown Mill produces a variety of specialty papers, including offset, copy paper, laser form bond and check paper. This campaign features content brought to you from The Paper Trail, Domtar’s award-winning digital transparency tool. Sharing the environmental, social and economic impacts of Domtar’s supply chain, The Paper Trail gives users a unique look at the people and places behind Domtar’s products. Users are presented with gate-to-gate impact estimates across five environmental categories: Fiber, GHG Emissions, Water, Renewable Energy and Waste. Visitors get a better feel for where their paper comes from after viewing mill histories, stories and even photos of local landmarks from the town that makes the paper they use. Finally, facts about the company’s positive effects on local communities and role as a major employer throughout North America are highlighted in the tool. With consumers increasingly concerned with the impacts of their purchase decisions, The Paper Trail offers the transparency they deserve. Start your journey today at www.domtarpapertrail.com.